Summer style for the beach! 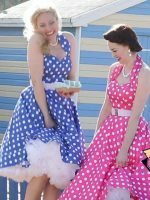 – If you’re a vintage style fan, and summer is beckoning toward refreshing your wardrobe, then you’ll most certainly be looking for 1940s/1950s style pants, frocks and tops. Our friends at Cats Like Us have a veritable feast of clothing to choose from. We’ve picked out just a few favourites for you to look at…. Foxy Party Dresses for Christmas !